Louisiana, known for its rich culture and heritage, was the final settlement for Tunica-Biloxi Tribe. The Tribe's roots reach far back into American history, their ancestors first made contact with European explorer Hernando De Soto in 1541 and has become a major economic and political force in the state of Louisiana. Since the beginning of the 20th Century the Tunica-Biloxi Tribe of Louisiana has made a concerted effort in ensuring the lives and well-being of its tribal members and that of its future generations. Realizing the state and federal governments' policies toward Native Americans during the 19th Century and the beginning of the 20th, such as the Allotment Act. The Allotment Act removed Native Americans from their ancestral lands and put them on some of the most unlivable lands in the country. The Tunica-Biloxi tribal leadership began its quest for recognition from the federal government. Many Road trips to Washington D.C. This involved many road trips to Washington D.C. by a handful of tribal members, who were working with very limited resources, mainly funding. Untold amounts of research needed to be done in Washington and Louisiana to prove the Tunica-Biloxi Tribe was indeed a tribe that had long continuous history. One tribal member was even asked to live in the D.C. area to do most of the research needed for the petition to be filed with the Bureau of Indian Affairs. It was under the leadership of Chairman Earl J. Barbry, Sr. that federal recognition of the Tunica-Biloxi Tribe finally took place in 1981. Receiving federal recognition was only a starting point in that it allowed for the application of funds to provide health service to tribal members and to set up an administrative office to oversee the growth of the tribe. And grow it has. Up until 1981 Chairman Barbry and the tribe focused on obtaining federal recognition and the benefits that came along with that status. Once the tribe was recognized Chairman Barbry and the various Council members turned their attention to economic development. Not content to rest on the sparse subsidies provided by the federal government, it was always Chairman Barbry's hope to see the tribe to one day become self sufficient. This was a difficult task since most banks and other financial institutions would not help the tribe finance any business ventures based on the fact that since the tribe was a sovereign nation they would have no way to recuperate their investment if the venture was not successful. The late 80s saw one industry embrace Indian Country's want for economic development, gaming. So the means for the Tunica-Biloxi Tribe to become economically self-sufficient turned up in 1991, ten years after the tribe received federal recognition, negotiations began for the approval and construction of Louisiana's first land based casino. Working under a compact with the state of Louisiana and having signed a management and construction agreement with Grand Casinos, Inc. of Minnesota, Grand Casino Avoyelles, (now Paragon Casino Resort) opened its doors to the public in June 1994 and has been running full steam ahead ever since. Expansion of the casino resort has continued to this day with the addition of a RV Park and a professionallly designed golf course, Tamahka Trails. In accomplishing this, Chairman Barbry saw another one of his goals realized which was that of helping not only his tribe, but also the people of the surrounding area. "Not long ago, Avoyelles was among the poorest parishes in Louisiana with unemployment rates higher than state and national averages. Now, with over 1,780 associates, the casino/resort offers training and educational opportunities that enable its associates to advance careers and a better quality of life. More jobs and a well-trained work force have benefited all the people, employees, business partners and tribal families," (Tunica-Biloxi Tribe of Louisiana 2002 Economic Impact Report). Of the casino's employees, 98 percent are non-Indian. Unemployment rates in Avoyelles Parish have significantly decreased and revenues have increased considerably. 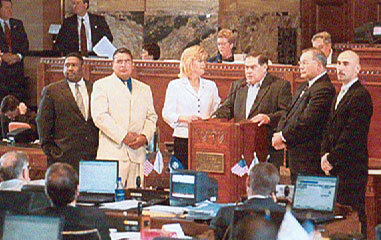 As part of the Tunica-Biloxi Tribe's ongoing effort to position itself on the local, state, and federal levels Chairman Barbry and the Tribal Council formed the Tunica-Biloxi Indians Political Action Committee (TBIPAC) in 1998. They appointed Councilman David Rivas, Jr. as the tribe's Director of Political Affairs to administer the TBIPAC. In addition two Council members were appointed to serve on the TBIPAC committee. "The average statewide campaign in Louisiana costs over three million dollars and races for Congress, U.S. Senate, the state legislature and even local races get more costly every year. There is no doubt that the old adage remains true, "Money is the mother's milk of politics." The Tunica-Biloxi Tribal Leadership understands this phenomenon and knows that they needed the tools and game plan to make the greatest political impact possible. That is why they formed the "TBIPAC" said Jim Nickel of Courson Nickel of Baton Rouge, TBIPAC January 2002 Newsletter. "In addition to the Tunica-Biloxi Tribe's economic impact in its surrounding area and the state of Louisiana, Indian gaming in general has had a profound impact on the lives of other Native American tribes and their non-indian neighbors. In the last decade we have seen the first real opportunities in the entire history of the United States for Indian tribes to gain economic prosperity," say Eric Tober, a principal at Johnston & Associates in Washington, D.C. Opposing forces in Washington, D.C.
Tober continues, "As a result of this good fortune, many opposing forces in Washington, D.C. are organizing to put the brakes on the futures of many tribes. Indian Country and Indian gaming are under constant attack from several members of Congress. Federal bureaucrats are failing to understand this Nation's historic and legal obligations to Indian tribes, and the federal courts are making changes to fundamental tenets of Indian law. If unchecked, these forces will erase much of what we as natives have accomplished and smother our future plans for further development." TBIPAC was formed for two purposes, to help our political friends and allies when they needed it and to fight back when our enemies threatened us. Stated plainly, tribes need the help and support of state and federal politicians. Politicians need help running campaigns that keep them in office and essentially allow them to continue the work they have laid out before themselves. In the tribe's case, making sure the politicians' constituents have a voice in Congress as legislators move on issues that directly impact Indian Country. The second reason is that the Tunica-Biloxi leadership realized it would be more effective politically,"....TBIPAC represents a diverse group of donors to political campaigns, "says Chairman Barbry. "When a political candidate receives a contribution from TBIPAC, he or she knows they are getting assistance from the Tunica-Biloxi Tribe of Louisiana. They also know they are garnering the financial support of a significant group of people from a diverse group of professions from in and out of Louisiana. 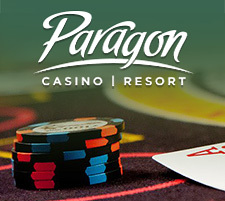 From bankers to lawyers to construction contractors to politicians to doctors to food distributors to well, just about all walks of life including our much valued Paragon Casino Resort associates are represented in TBIPAC, " says Rivas. The meetings were effective in their purpose, but the TBIPAC staff realized they needed an event to "rally the troops" and raise funds at the same time. Hence, the Annual TBIPAC Golf Tournament was born. In a little over two years the tournament became the single most successful Native American political fundraiser in America. Hundreds of business leaders, community leaders, and political leaders turn out for a day and a half of fun events and meetings resulting in hundreds of thousands of dollars being raised for TBIPAC. The tournament is becoming a fixture on the calendars of legislatures, congressmen, judges, local and parish officials, and many others. The active participation of Chairman Barbry and the Tribal Council is the main reason for that success. The impact this event has is immeasurable and flourishing fundraising and development of key relationships with politicians and others. 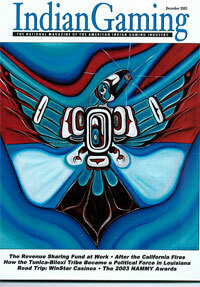 It fosters greater understanding of the tribe's important issues with both business friends and friends in government. The combination is exactly what is needed to form an effective political force for the Tunica-Biloxi Tribe. The force has proven itself time and time again. Just within the past five years a formidable list of the Who's Who in American and Louisiana politics has visited the reservation in the Tribe's Government to Government Luncheon Series. The list of participants has included U.S. Senator John Breaux, U.S. Senator Ted Kennedy, U.S. Senator Mary Landrieu, U.S. Congressman Patrick Kennedy, U.S. Congressman William Jefferson, U.S. Congressman Rodney Alexander, Lt. Governor Kathleen Blanco, over 30 members of the Louisiana State Senate and House of Representatives and numerous parish and local officials. "They (the visits) prove that through communications and support of candidates the Tunica-Biloxi Tribe can be an effective advocate on important Native American issues like taxes, health care and educations," says Nickel. "The Tunica-Biloxi Tribe is committed to protecting its rights and the success that it has brought to the entire surrounding community in Avoyelles Parish. The TBIPAC is critical to this effort. By supporting candidates for federal, state, and local office who support the tribe's issues, it is leveling the playing field so that it will have a chance to fight off its attackers and secure its future, "says Tober. The TBIPAC works to develop and foster supportive relationships between the tribe and local, state and federal legislators and officials. The reason being to protect and preserve the legal and diplomatic relationship that has existed since the founding of this country between Native American peoples and the United States. This traditional connection is just as vital and important today as it was over two hundred years ago. "We, as representatives of our tribe, must never forget that the responsibilities that have been bestowed upon us by the people is not a mere gesture to fulfill a void or to dictate authority, but what is truly an opportunity to create effective change that may one day assist the Tunica-Biloxi Tribe in fulfilling total economic independence and create a shield for sovereignty that no bureaucrat politician or self interest group in Washington D.C. or even with in our own state could ever penetrate. It must be as tough as the strongest substance known to man and as tall as the highest elevation in the world, so when looked upon this shield not only intimidates, but also discourages all those who attempt to pierce or destroy it. If it is the political game we must play then let us not just be observers, watching from the sideline, but well trained players who will take on all challengers to defer that which is most precious to us, our sovereignty and our people," David Rivas, Jr., Director of Political Affairs. Chairman Barbry has always stood behind the PAC and how it helps the tribe get its side heard in both Baton Rouge and Washington. "One of the most important tools in politics is an active political action committee. As our tribal investments and enterprises grow so will our political strength and social responsibilities. It's just another step in fufilling our motto, Cherishing Our Past, Building Our Future," says Chairman Barbry. "Source: Indian Gaming magazine December 2003"